Since iOS 8, iPhone, iPad and iPod touch now may show an app icon on the lower left corner of the lock screen. The app icon appeared regardless of whether the app is installed on the iDevice or not. Pulling up or swiping up on the icon either opens the app (if the app is already installed) or takes you straight to the app listing in the App Store to download the app (if the apps is not yet installed). Some examples of the apps that may appear on lock screen’s bottom left corner including Apple Store, Walmart, Vons, Starbucks, Tesco, Cotsco, King Soopers and may other apps from banks, shopping malls, restaurants, retail outlets, businesses, gas stations, gyms, airlines, transit guides and etc. The “Suggested Apps” feature is new to iOS 8. It uses information about your current location based on GPS geofence or iBeacon to determine if nearly venue has any relevant iOS app in the App Store, and if there is, it will recommend and suggest the app by showing the app’s icon (or App Store icon if the app doesn’t yet install on the device) on the bottom left corner of the lock screen, and also app switcher, which is less prominent. While the intention of Suggested Apps is good, but most of the time, the suggested app offers nothing much other than annoyances. And it may subjected by abuse or spam by developers who want to make their apps standout. 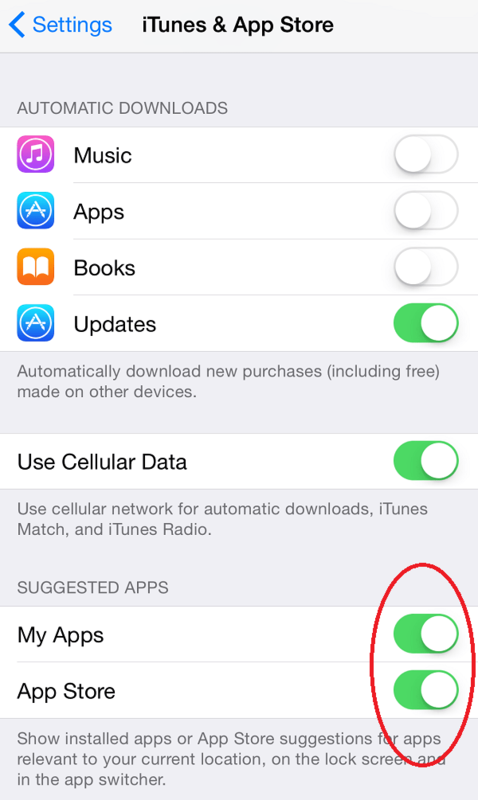 For those who do not feel like getting any benefits or deals from the suggested apps, Apple provides a way to switch off and disable the feature.